I am far from perfect. My record, both as a person and especially as a Christian, is far from perfect. I am no better than any other human being on this planet, but God has blessed me with honesty, not just with others, but honesty with myself. Because of this, I have rarely strayed far from general morality. My conscience has always gotten the best of me. However, as I entered young adulthood, I went through a period of “breaking out”. I had been raised in a fairly strict, sheltered home. I did not get my first kiss until I was 19, and I had to go out-of-state to even make that happen. By 20 I was my own woman, making my own decisions, being adventurous for the first time in my life and quickly gaining a new-found confidence. This was not always for the better, in fact I made many mistakes and did many things I’m not proud of. I met and married my husband when I was 21. I had been out of my parents house a little over a year. I did not know it at the time, but this was one of the better things that would come from this time period of wild self-governing. I started to settle back down a little, at least, I was with one man and we were trying to be independent adults. We did not make the best long-term decisions for at least the first year of our marriage. Actually, I feel like this year, the beginning of our sixth year, is finding us finally starting to make good decisions when looking at the big, long-term picture. The first year, however, was pretty touch and go. I was a server, he was a chef, there was a lot of de-stressing with drinks at the bar late into the night, a little sleeping, and then starting another night shift at our restaurants to repeat the cycle. We knew from the get go that we wanted a couple of kids, but we did have the presence of mind to wait a year before getting pregnant with our first child. Part one of this story shares the links that talk about Skye’s birth and death, but I will add here, for my readers who don’t know, that during my pregnancy, we also moved from Kentucky to Colorado to open our own restaurant. However, due to our over excitement, lack of reading the signs, and some naivety, we got involved with the wrong business partners and lost our business a few months after moving there. We had accumulated about $15,000 in debt from those few short months alone. To make matters worse, the only work Josh could get after closing our restaurant was over 100 miles away one way and gas was almost $5 a gallon in that area at that time. One more month and we were so broke, there was only one thing left to do. We sold almost everything we owned that we still had, furniture, tv, bed. We tried to sell other things like my much-loved and treasured piano that had been with me through my life crisis at 18 and had been fought for time after time when my dad and my husband had not wanted to move it on several occasions. Nobody cared though, nobody cared about the tears that had polished those keys as I wrote poetry in my old tattered note-book and poured my soul out in song there. Nobody valued my old, weathered friend, and in the end, we left it there with other odds and ends of personal treasures that nobody valued but me. We loaded the stuff that was essential, the stuff that could fit into the smallest trailer U-haul offered, pulled behind our little car. Most of it was stuff for our baby who I was due to deliver in 3 weeks. We drove back home to Kentucky to move in with my parents. We had no job, no house, we lived in one of the bedrooms that one of my five sisters vacated for us. We had lost everything, we had no money. 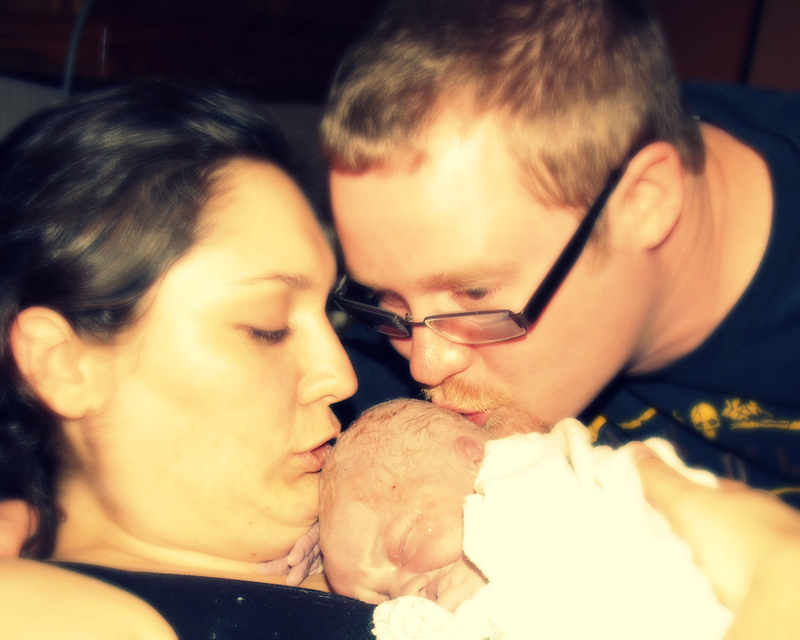 We were about as destitute as we could be – then we lost our baby girl. It is hard to convey these feelings that are conjured up at remembering this horrible time. What I had gone through before in life was so pale compared to this that it is transparent. There is not a term to describe what I felt as I attempted to begin living in the wake of these horrible events. I just know that it is exactly how Job must have felt. Josh had gotten a job at a small town restaurant 2 days before I delivered. His employers were wonderful, upon hearing that he would be gone indefinitely to stay in Louisville at the Ronald McDonald House to be there for our angel in the NICU at Kosair, they said he could take whatever time he needed and his job would be there when he was ready to come back. Of course, we did not know that would be just a little over 17 days later, once the funerals were done. There were two, one for my family and friends in Willisburg, then another in Salem, Western Kentucky for his family. For almost every single one of his many family members, seeing Skye in her coffin was the first time they got to meet her. It was absolutely heart wrenching. So, there is a lot of cloudiness. I have very little about the following months that I remember. I guess I have blocked them out as a coping mechanism. The initial time during the days following her death, the funerals, there was a lot of numbness. There was a lot of crying and numbness and more crying. When we got home to my parents house after the funeral in Salem, we both decided we needed our own place. Obviously, we had only money that wonderful family and church family gave us, so we moved into the cheapest place we could find, about 20 miles from my parents. It was an old, very small school building that had been converted into apartments. If there is one word I could use to describe this apartment it would be “dank”. We might as well have lived in a cave. It was dark carpet, dark paneling, it had inadequate lighting for a place that had an all white interior, let alone the dark interior. It had 2 very small windows on one side of the apartment, the other side opened into the long hall. It came with an old broken down couch and chair, also in dark colors, that smelled badly. It would have been deeply depressing for a unicorn made of rainbows, let alone for two grieving young people who had nothing. As the days passed, Josh went back to work. I also tried to work. I thought throwing myself into a job would be a good thing. I got a job serving at the little country place Josh worked. Long story short, there was very little traffic to that restaurant for reasons that became very obvious to Josh and I, and it seemed like every table I got was a young couple with a baby girl. Needless to say, I didn’t last too long. I was a mess. I found myself with a lot of time, after I quit working, to sit alone in that horrid apartment. Winter had set in, it was so cold. I did a lot of sleeping. The only good thing about all that darkness was it fostered sleeping. Josh would get up at 7am to be to work by 8am and I would sleep. Sometimes I’d get up and eat something then go back to sleep until he got home around 9pm. I had set up all Skye’s things in the second bedroom of this apartment, I had put the blankets and fluffy animals in her crib, I had put up her few pictures, painful pictures of her wrapped in gauze, or the ones of her the day she was born, fire engine red with pieces of her skin coming off and wrapped in clear plastic. Her room was beautiful, one of the two windows lit it up quite well, ironically. There were hours where I would sit in there cradling her pictures and weep for her. My heart felt like it was being pulled out of my body through my throat and that feeling only went away when I would sleep. I was much older and much more mature at this point. Having gone through my crisis at 18 and surviving 5 years of complete Hell, I knew at least with my heart that this thing I was going through now also had a purpose and it too would pass. My brain refused to acknowledge the things that my heart said, however. My brain wanted very badly to convince my heart that these things were not true, because misery loves company I guess. But even when my brain would get close to convincing my heart that its belief was ridiculous, my heart would always counter that without hope, life really would become unbearable. Without the hope of one day seeing my daughter again, she would just be a tragedy with no closure. Without the hope of this being a tiny piece of a bigger picture filled with greater good, my life would just become one giant tragedy of loss and waste and pain. I feel a bit like I am rambling. It is just so hard to describe and then condense grief into these few paragraphs. However, one thing I know, it is over 3 years later and while the pain is still there to some extent and always will be, my God helped me through this tragedy. Without hope in my God, without faith to believe He has a purpose, I would have been crushed under the weight of unthinkable hopelessness, under the thought that everything I have experienced is for nothing. God does not create pain. The imperfection of man and humanity, the flaws of a mortal body, that creates pain, tragedy, loss, etc. God allows these things, however, because He knows that we need them to become stronger. You cannot help a baby bird hatch from its egg, it needs the pain, the struggle, to make it strong enough to live. God could not help me “hatch” from my “egg” because He knew that I too needed extra strength to face what life had for me. So I have explained why my crisis at 18 was necessary to help me through the death of my daughter, but why did my daughter have to die? What is the purpose there? Well, I’ve again run out of time and will save more of my thoughts for another post. We recently got cable service installed after almost a year without television. Since moving to Bowling Green, we were able to pick up somebody else’s WiFi, free of charge. It was rather nice, and we could watch the shows we liked on Hulu, so we didn’t really miss the tv. About a week or so ago our luck ran out and our unknowingly generous neighbor no longer provided us a signal, so we decided the only thing to do was break down and get our own hookup. Since the internet alone would be just as expensive as a tv/internet package because of the bundling discount, my husband decided to go ahead with the cable hookup and we secured a tv from his mom to use as long as we needed it. We happened to have tv through the first 8 months of both of my pregnancies. I found a show that came on in the morning when I was not working and got into it. “A Baby Story”, a kind of documentary type show that follows a couple or family through a pregnancy, labor, and bringing the baby home. When I found out I was pregnant with Skye, I watched this show to try to prepare for labor by keeping all the different situations and techniques fresh on my mind. Ironically, not one of those shows prepared me for what happened with my first baby. 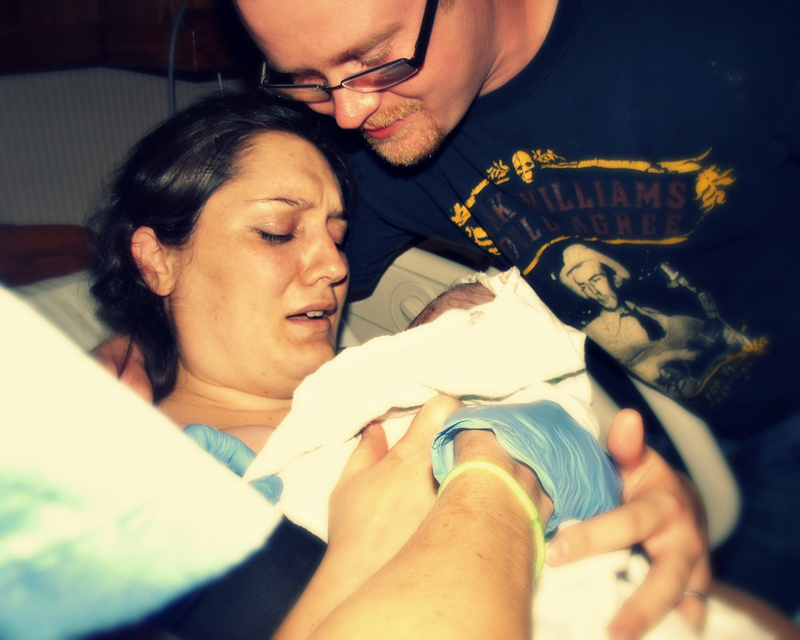 The labor, the breathing, the actual delivery – that I was prepared for and seemed to ace. The part where I receive my little bundle of joy all wrapped up and pink and warm – that never happened. My first real look at my baby was just a tiny face, everything else was wrapped in sterile gauze because of her condition, and she was in an isolet being transported two hours away to a bigger hospital. She had an immune disorder/skin condition that left her with the top layers of skin coming off at birth. There was a high risk of infection, fluid loss, heat loss, and the condition was so rare that it remains undiagnosed to this day, despite many different specialist teams in many different states over a 17 day period trying very hard to figure out the puzzle. We had no clue about her condition as all my prenatal tests came back normal and there was no reason to do additional tests. It is not even clear if there were additional tests that could be done. Other than her skin, she seemed fairly healthy, but after just a few hours there were issues with her blood counts and platelet levels. The doctors had a very hard time with “chicken or egg” syndrome. Was her immune condition a result of her skin, or was her skin a result of the immune condition? Did the fact that her exterior was compromised signal her body’s blood cell production negatively, or was it the blood cells that were the root of the problem? With no real idea of an approach to take the doctors were flying blind and treated for many different things at once. Wrapped in plastic to retain heat and moisture until the specialist team arrived, this was Skye's first picture. I’d like to stop here and say that while I feel this story will one day be told, I cannot go down that road today. I can only say that the loss of a child for a mother is NEVER forgotten, even as the memory dims for friends and family, there is not a day that goes by that I don’t think about my baby girl who was taken from me so soon after she had arrived. That was in 2008. 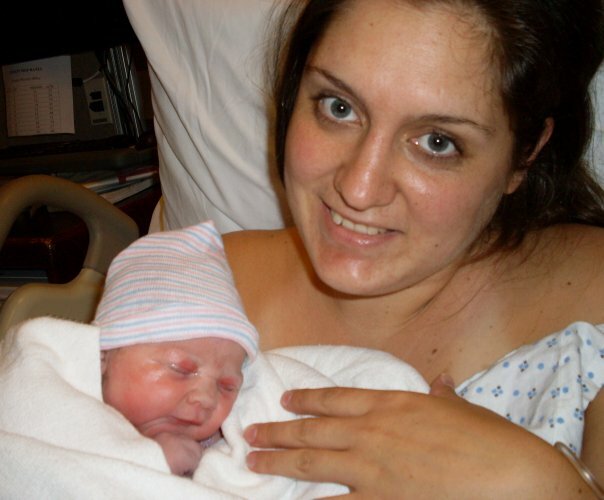 In 2009, I found myself pregnant once more. Because of my previous history and the possibility of it being a genetic condition, I underwent many more tests, ultrasounds, doctors’ visits, and had a higher level of emotional stress. If you stop to realize that during my pregnancy with Skye we moved cross-country, opened a restaurant, worked it almost single-handedly, lost the business, moved back from Colorado to Kentucky, and moved in with my parents because we had literally nothing, you can maybe begin to imagine how stressful that was along with being pregnant for the first time and completely isolated from any family except my husband. 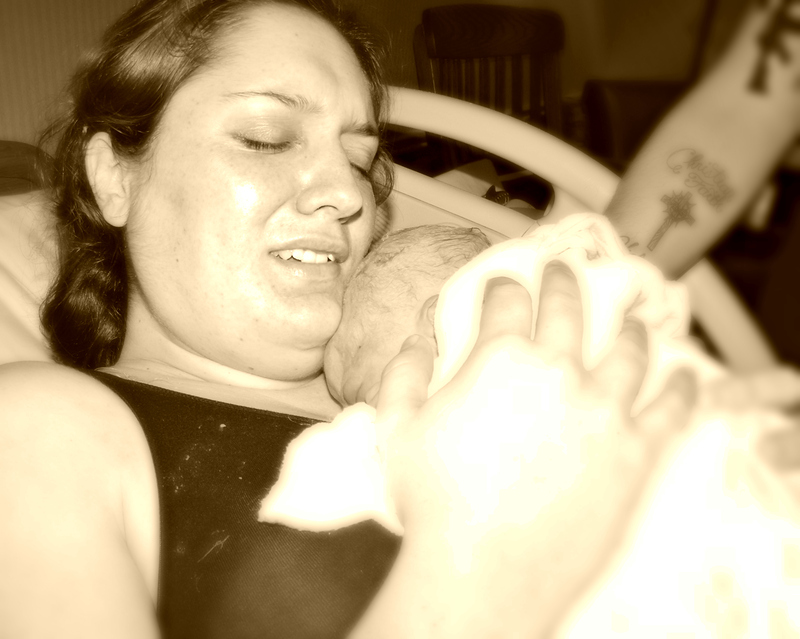 Now – my second pregnancy was more emotionally stressful than all that, for me. I can’t really explain my feelings here, there just aren’t words. Only somebody who has watched their tiny baby die in their arms, the little chest stop rising and falling, the tiny heart stop beating, can understand the terror of it happening again. Even though most of my prenatal appointments had all good news and I did not have a deep feeling that there was something wrong (I did feel there was something unexplainably wrong when I was pregnant with Skye ) my second pregnancy was terrifying. For starters, it was completely different from my first, my body did different things. My doctor said it should be fine to exercise regularly, but I decided to go with my own gut instinct and remain as physically unstressed as possible. I felt my first Braxton-Hicks contractions very early, at about 20 weeks. Shortly after that I had to go back to serving at Applebee’s for a time and every day had me on pins and needles as my contractions became a lot stronger. By the end of most days, I was not even sure if I was in labor or not, they were that strong, and I waited for my water to break, praying it wouldn’t happen as I was not even 30 weeks. I did a lot of praying and I just willed myself to believe every day that my baby would be fine, that I would get to hold her and kiss her. At 29 weeks I was able to stop working and in the next few days an ultrasound showed a possibility that the baby might be affected by intrauterine growth restriction as she measured a bit small. (This later proved to be a false scare when she arrived at a normal weight with normal head, chest, and thigh measurements.) This gave me new waves of anxiety, but I was not working and I just rested and stayed as calm as possible. We had never even begun to recover from our losses in Colorado or the death of our first baby. To make matters worse my husband, who was still dealing with unexpressed grief, was having trouble securing a permanent job that could support us, we had only a mattress set for furniture, and we were behind on bills. I escaped all of this stress, whenever possible, by watching “A Baby Story”. I would cry every time the baby was laid on its mother’s chest, longing and aching to feel that and see that miracle in my arms. I did finally have that beautiful experience. 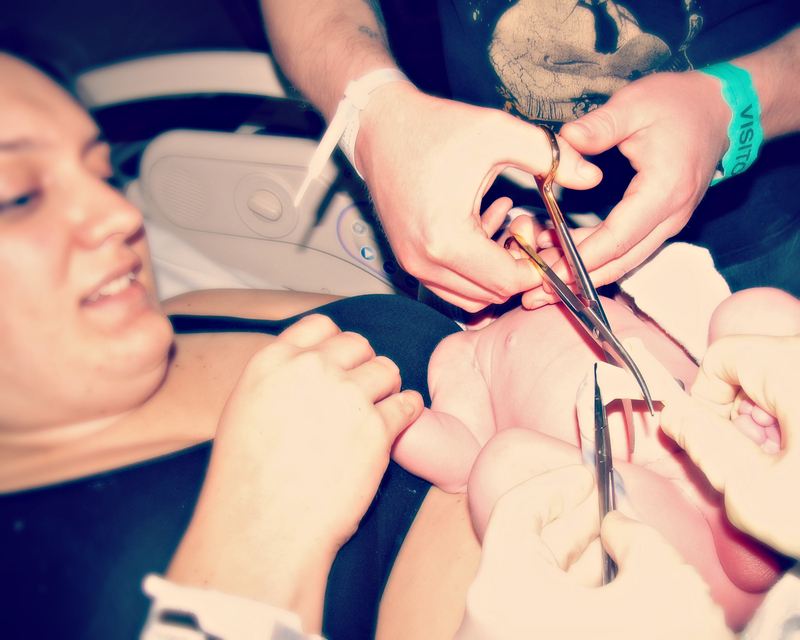 After months of worry, weeks of ultrasounds (1 every week for the last ten weeks of my pregnancy) days of waiting, hours of labor, I experienced that one moment as if it was in slow motion. It was breath-taking. Tiny flailing arms, a turned down lip at the cold reality of the world outside her protective womb, bare and beautifully naked, with perfect skin and a mop of brown hair, crying heartily her displeasure at this disruption of her former life, Christian Faith Champion entered the world on August 19, 2009. She has been my dream come true ever since. With tv service once more, and an active little girl who likes to wake up no later than 6am, I have found my old stand by tv show, the one program of interest nestled between infomercials at such an ungodly morning hour when a normal body is craving that last sweet hour of slumber. 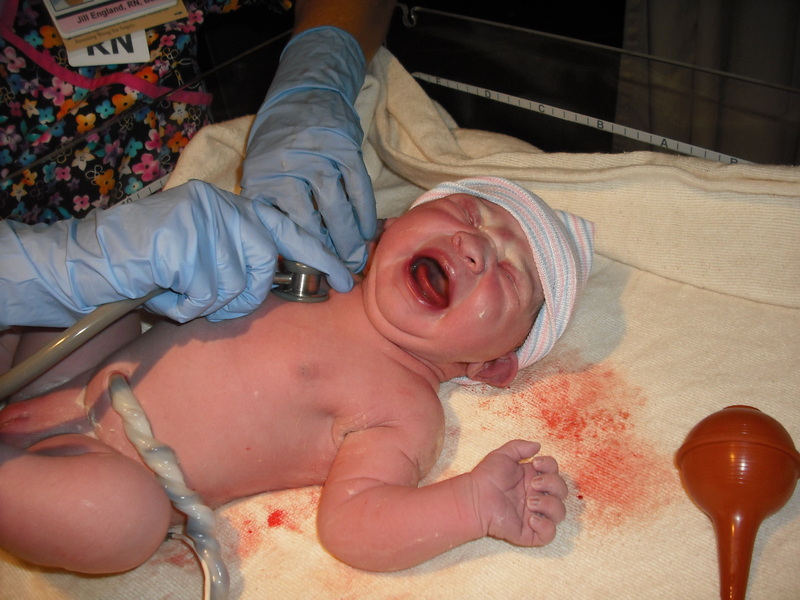 I feel the birth pains with those poor women and wonder why I am putting myself through this emotional discomfort. Then that beautiful little baby enters the world, breathes its first breath, and every one is so happy and there are tears every where. I remember my little moment and I can be joyful for people I’ve never met and who I don’t know. Even as I look at my second baby girl, now nine months old and still healthy and beautiful, I realize that I’ve never really had a normal pregnancy experience, nor will I. The strange circumstances of our life during my pregnancy with Skye were a far cry from the easy, doting, blissful ignorance of a first pregnancy and my second was not nearly the clear, sure experience of a normal second pregnancy. Because of the history, I will never have a normal pregnancy, there will always be worry, extra tests, more fanfare. The chances of Skye’s condition being genetic have generally been dismissed as slim, but there will always be a terror in the back of my mind, creating stress. Josh and I have talked about the pros and cons of having another child. Having my first two so close together took a toll on my body. I still have no desire to go through this process again, but I don’t know if it is too soon to tell for sure. I always saw myself with two. It was never the plan to lose one, it never is, but the fact remains, I’ve had my two. I never thought past that. There are friends and family who tell me it’s just a bit soon, that I’ll want another down the road, and there are others who tell me to quit while I’m ahead. These are the general extremes, and while I value the advice of people who know me well, I know that it is only mine and Josh’s decision and no one else’s. I guess the hardest hurdle to overcome for us is the “trying”. Neither of us can imagine setting out to conceive a child on purpose. We were “trying” with Skye and actually “not trying” with Faith. The emotional step it takes to decide, with your actions and not just your mind, to create life, is just not one we are ready to take. We may never be ready to take it. We are both o.k. with this. If we never have another baby, we are more than thrilled with the two beautiful gems we have, one here with us and the other waiting on us in Heaven. If we are blessed with another pregnancy unexpectedly, we will pray and believe that God will deliver that child safely into our arms too.